I made sure to catch the space shuttle Endeavour flying overhead on September 21st. I went up to Los Angeles on October 14 to watch it making the challenging journey to its new home at the California Science Center (see my photo gallery, right). Naturally, I had to go back and see the Endeavour once it was installed in its new exhibit. In fact, I attented a members-only sneak preview on October 27, 2012, three days before Endeavour opens to the public. Here's my photos from that visit! Take a walk under the shuttle with me! Eventually, Endeavour will be housed in a new museum hall, strapped vertically to a full-sized replica of its booster rockets and fuel tank on a mock-up launch pad. Ramps at multiple levels will allow visitors to view it from up close. For now, Endeavour is living in a temporary hangar at the California Science Center, the Samuel Oschin Pavillion. Leading to the hangar is a small but fascinating with great videos of launches and landings, parts of the shuttle's interior (sorry, I'll have to get a photo of the space potty on my next visit), information about Endeavour's missions and accomplishments, and a great VR simulator ride that lets you experience a lift off, orbit, and landing. There's also a gift shop, of course. 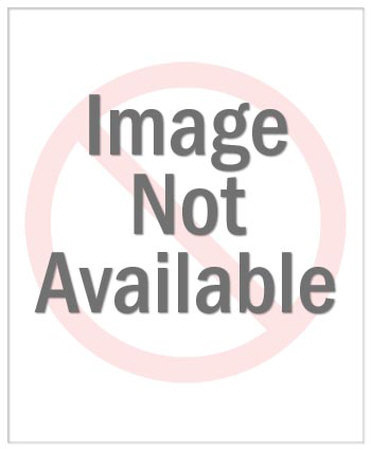 I was tempted to buy a "shuttle crossing" sign. This temporary Endeavour exhibit is still pretty basic, but already fascinating enough to occupy an entire afternoon. 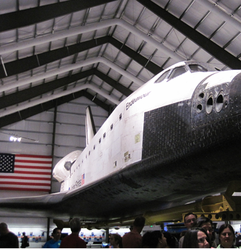 For me, however, it was simply a thrill to walk right under Endeavour and look up at those reentry-scarred tiles. I've talked about what the space shuttle means to me before, and I confess that I teared up when I first walked under it and stood looking up at a real, live, reentry-scarred spaceship hanging just above my head. It's flown in space, and I touched it! Great detailed photos of Endeavour being built. Named by students, Endeavour was named for the ship of explorer James Cook. replica of the launch control center at KSC. Endeavour fills the hangar dramatically. Dark heat tiles were replaced more recently; others are burned from repeated reentry (more than 3000 degrees F). Underside of wing flap's joint & tail. The one black tile probably was new for Endeavour's very last mission. It lands as a glider, with no do-overs. Extra heat shielding for the front. Thrusters on nose and tail helped shuttle spin and turn gracefully in space. 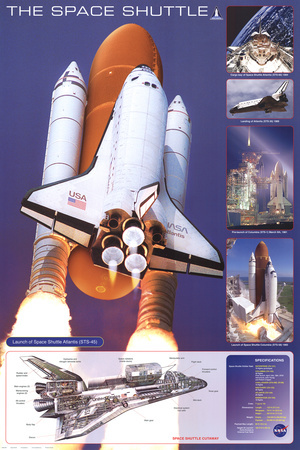 Endeavour was built to replace the Challenger, lost in 1986. Endeavour was named after the British explorer James Cook's HMS Endeavour, hence the British rather than American spelling. Since Endeavour was built nearly two decades after the first space shuttle orbiters, she had many upgrades: she was lighter, had better avionics, better plumbing (! ), and was capable of spending up to 28 days in space, although this limit was never put to the test. 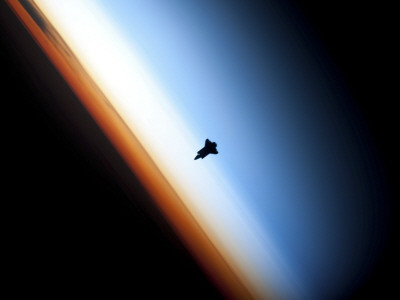 Although Endeavour is the youngest space shuttle, she still had her share of adventures. Logging 299 days in space and nearly 123 million miles over 25 missions, Endeavour saved the Hubble Space Telescope, rescued and delivered several satellites, served as laboratory space for many science experiments with practical applications (particularly medical technology) back on Earth, and delivered and assembled major portions of the International Space Station. Endeavour's maiden voyage was May 7, 1992. She touched down for the last time on June 1, 2011, under the leadership of Commander Mark Kelly, husband of Arizona Congresswoman Gabrielle ("Gabby") Giffords. Due to bad weather in Florida, Endeavour's final landing was at Edwards Air Force Base in southern California, where she later returned while piggybacked to a Boeing 747 en route to her new home in Los Angeles. I strongly recommend the "When We Left Earth" series: great space footage, fabulous history of whole space program. 1-300 Scale. From the Model Power Postage Stamp Series. Fully painted with detailed history of aircraft, embossed stand super detailing. No assembly required. thomo: I feel the same way. On the bright side, while (as usual) news coverage is totally ignoring the existing space program, a Dragon Capsule has been hooked to the ISS for 3 weeks and just undocked and splashed down successfully yesterday, marking the first time a commercial company's spacecraft returned science samples and materials from space. Until now, that was the kind of mission that could only be government-funded. Manned Dragon flights are probably 2 years away.